Armorama :: B.o.B. or elsewhere? Need assistance. B.o.B. or elsewhere? Need assistance. I'm making a Dio set in the winter that I plan on entering into a contest/show. It's a tank with Germans advancing over a bridge. 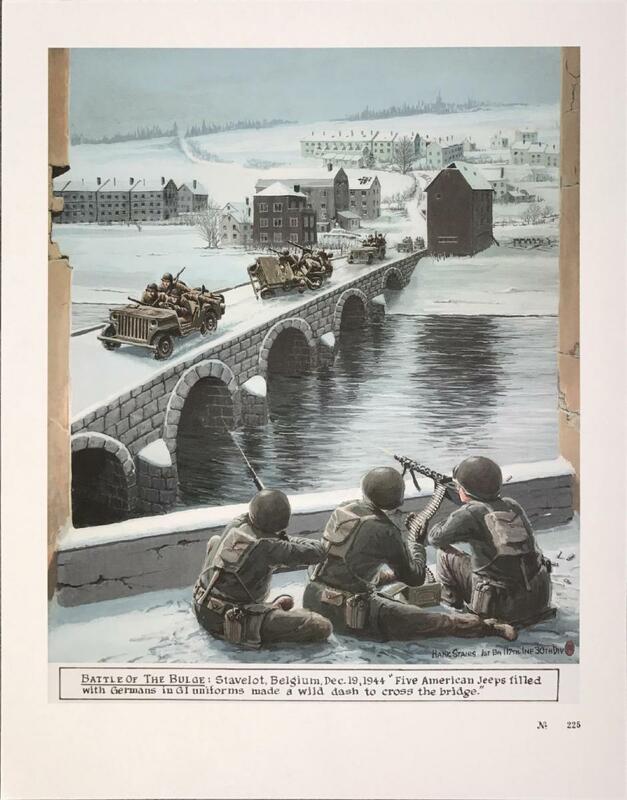 I was initially planning on having the scene take place during the Ardennes offensive but I'm not sure there being a bridge intact in the middle of combat in the Ardennes will be historically accurate. With it being entered in a contest how specific will the judges be about the presence or lack thereof of a bridge like this. I'm thinking if I specifiy it's on the outskirts of a town that has a few streams nearby that would suffice but not having been in a a contest I'm not sure if I'm making a big deal out of this or not. If this would be an oversight on my part, where else in the European theatre may I turn to set this scene that would be historically appropriate? Ideally I'd like to have it be a B.o.B Dio. Thanks! Bridge aside, unless I'm mistaken there was no snow during the BoB. By B.o.B., is he referring to Band of Brothers? 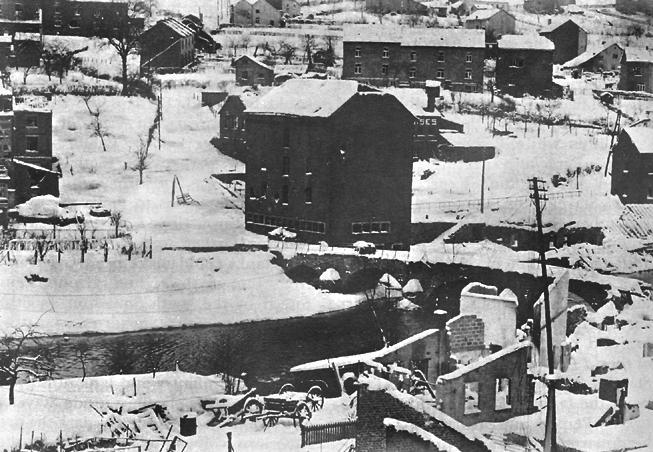 There was one episode that centered on the bitter cold winter in the Ardennes. That being said, I don't imagine that every bridge was destroyed. There had to be some minor ones that survived. Depending on the category you entered, Judges evaluate how well you do the basics. Did you remove all the flash on the parts. Is there glue showing? Are there sink marks? Is there any problems with the paint? Is the weathering approperate? Do all the parts fit correctly? That's where I would focus. The other stuff is just bling. Do what you have in mind and don't worry about it. There were some small bridges intact because the first stages of the attack were rapid and unexpected. Usually when there's talk of blown bridges it's over the major rivers in the area. There were still plenty of bridges intact throughout the BoB, especially older stone bridges. Mainly, it was snow-free until Christmas Eve. It did snow previously, at night, but melted during the day making the roads and fields very muddy during the initial stages of the battle. This has been a huge help, thanks everyone. Something to keep in mind. The area the battle was fought in had recently been retreated from by the Germans. Any bridges the Germans blew were rebuilt by the GIs for the most part,behind the lines. You may be thinking of the bridges blown by the GIs right in front of the Germans advance units. Anyway,you are OK with showing undamaged bridges,blown bridges or re-built bridges. Just depends on time and location. Finding and CAPTURING Allied fuel dumps were also big priorities during the battle. Also, there were a number of bridges that US Army units did not have time to destroy in their retreat from the German forces. I think you are mistaken... 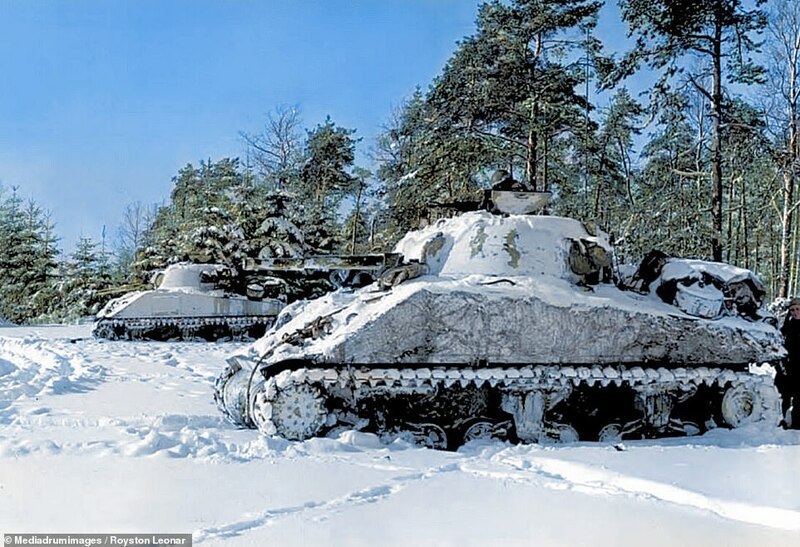 There was quite a bit of snow during the Battle Of the Bulge, unless I'M the one that is mistaken, and everyone is talking about the "BAND OF BROTHERS" HBO Mini-series. Go for it! Build your bridge with snow and everything. EXACTLY what I was trying to express! None of the above photos are dated, but I know some, or most, were taken after Jan. 1, 1945. 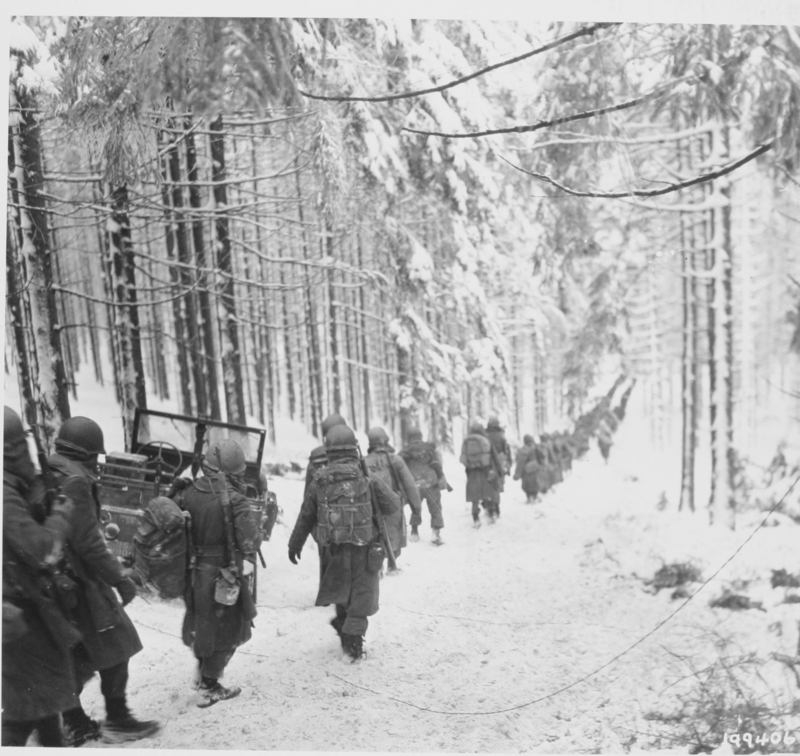 I believe the photo with the marching infantry was taken in the Huertguen Forest just before BoB, where it did snow - a lot. Snow was very patchy and regional. A good reference is examining photos taken by the Germans. Their photos generally show little snow on the ground during their initial advances. I did say unless I was mistaken...Apparently I was. Not so fast-- the Ardennes is a large place. To say there was "no" snow is likely incorrect. Don't forget, there was no allied air support for several days due to bad weather. The Germans specifically were waiting for bad weather to advance, and there are plenty of narratives with snow, sleet, rain and sub freezing temps. So to say there was "no" snow is probably not correct depending on the day and the exact location, the amount of snow may be questionable depending on location, but it's likely there was snow. We know there was snow for sure (as the photos depict) after Christmas. We also know that to the south of the Ardennes there was lots of snow. I for one can verify a witness of snow on the Fourth of July at Wildflecken in Germany (1978). So I'm sure there was snow somewhere in the Ardennes at sometime during the BoB. I based my initial reply on the recollection of my pastor who's only memory of his WWII service was that he spent Christmas Day wading through waist deep freezing water carrying his rifle over his head to keep it dry. He never mentioned any snow. Sadly he passed years ago. I suppose that more properly it was not snowing during the initial stages of the battle not that there was no snow. This is a good read as it talks about the effects of weather on the battle. Man, let me just say you guys rock. You have all been super helpful. I've seen that same photo of Stavelot bridge, it's similar in construction but only has one arch and won't be set in a town/city like that one. Still a great photo, I just now noticed the King Tiger on the other side of the river. I hope the judges are a bunch of "uninformed idiots" cause then maybe I'll have a chance of winning something. I kid! I kid! I know I have room for improvement and I'm sure they're going to notice some deficiencies in the final product, hopefully they will get me some pointers. At this point I'm close to completing the base so I'm going to stick with it, I sort of have to as I need to finish it soon. It's gonna be an intact bridge, in the middle of the Ardennes during the Battle of the Bulge. 1st SS skirmishing outside of Wanne, which is southwest of Stavelot. Neat. The Book "Battle of the Bulge through the lens" has numerous photographs taken during BOB showing light to heavy snow on the ground. The photographs are all dated during the period and the beauty is that it is a 'then and now' book with pictures of the same location as they appeared at the time of print as well as the WW2 photos - so the locations of the photos are known. The photos show a wide range of locations, so snowfall was likely not as patchy as previously suggested, although may have been lighter day to day. As to bridges, the Germans needed large bridges to take the weight of the Panthers and Konigstigers and allow rapid advances. These were the bridges targeted and destroyed by the allies. Smaller bridges were also used where necessary, especially during the retreat, but several were damaged by collapsing under the weight of the retreating German tanks. Plenty of photographic evidence of that. According to Avalon Hill's Boardgame "Kampfgruppe Peiper", which is perhaps one of the best researched accounts at the finer level of detail, in the Ardennes Offensive, whilst it was overcast there was not a great deal of snow in the opening days, as was mentioned earlier. From the 18th of December, there was something of a thaw that turned conditions to mud, this persisted until the 22/23 Dec when a "Russian High" moved through that started to bring the first snow falls which by the 29th had developed into full-on arctic blizzard conditions. "Why do so many photographs show snow" - you tend not to take too many pictures when you are running for your life. Once the situation stabilised (German offensive stopped around the 24/25th) the photographers were out in force after the snow had come. "WE ROCK, CUZ THAT'S WHAT WE DO!!!" "Thumbs Up" for everyone involved!!! I don't recall seeing that particular photo of Stavelot before...very cool. A case in point for German photos; photo-journalists (or propagandists) assigned to LLAH took plenty of photos and films during the early stages. Those embedded in Kampfgruppe Peiper were either captured, or their ditched equipment was confiscated by advancing US troops around Dec. 25. German photos show some, but little, snow up until around Christmas. Most US photos are taken during their counter-attacks after that time, when the heavier snow occurred, and thus show more snow.